Now, if you follow me right here on my blog, over on Pinterest, YouTube, or even Facebook, I am sure you have heard me talk about the “rule of threes” in design. I have eluded to it both on my blog and in my YouTube videos. And…I really can’t stress its importance enough. Following this simple rule when creating cards, scrapbook layouts, or pretty much any creative project you can think of will add a little something extra visually yummy to any project. So…while cruising around the internet the other night, I happened upon a lady name Debbie Hodge. Debbie has some serious credentials that she uses to pull her blog together, in which focuses on a variety of design principles that can be applied to any of your creative projects. 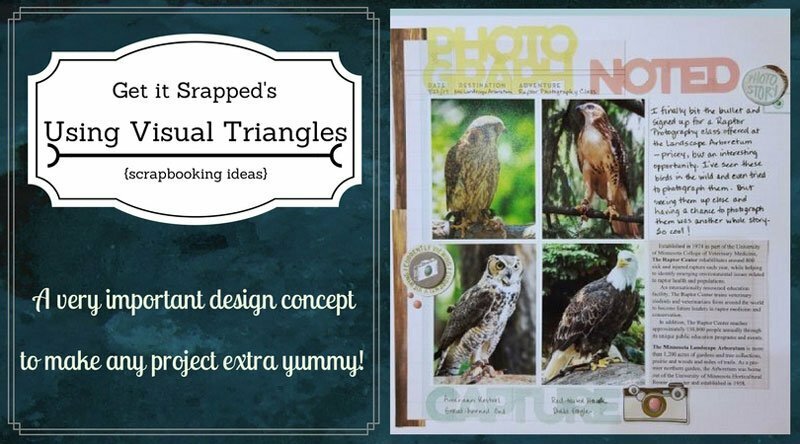 This month, she focuses on creating visual triangles (using the rule of threes) in scrapbook layouts. I hope enjoy what Debbie has to offer on the topic. I apologize for not doing anything myself this month. Regardless, I’m pretty sure you won’t be disappointed in the plethora of information Debbie has to share 🙂 If you have any suggestions for future tutorials you’d like to see, please leave me a comment here on my blog, pop over to the Facebook Group, or send me a message from my contact page. Cheers and thanks for popping by!